If you are searching for a rebounder trampoline like no other, you do not need to look any further than the Urban Rebounder Trampoline. It provides anyone who is looking for an outstanding workout, everything that they could possibly want. It is one of the most popular choices for most anyone who is interested in all that a rebound workout can provide you. Are you ready to bounce your way to a healthier you? This workout trampoline provides more of everything. When you purchase it, you are going to get a lightweight, 29 pound, mini trampoline that can accommodate and improve the health of anyone who is up to 300 pounds. You can use it even if you are a little unstable on your feet due to a past injury because it has a stabilizing bar for you to hold on to and in fact, it is designed to help improve balance and coordination by strengthening your body’s core. It is also built to be stable. Even though it is small by trampoline standards at only 10”x40” diameter, it has 8 legs total. There are two long front legs, and two shorter back legs. There are also 14 rubber crutch tips for the legs. To ensure that you get the most out of your trampoline exercises you will get a Rebecca Kennedy workout DVD. This DVD includes six motivational workout routines that are guaranteed to help you get results quickly. 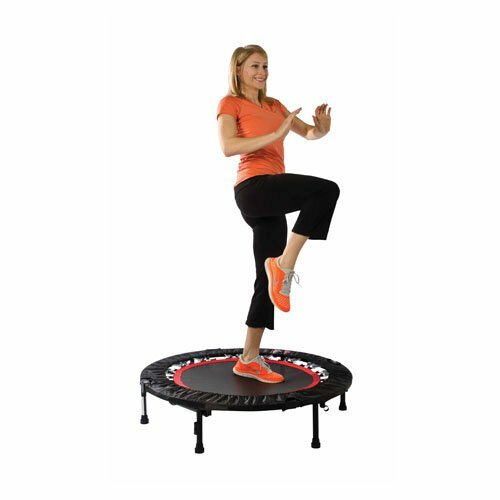 This rebounding trampoline is also easy to set up and the first time you use it, it should only take you about 15 minutes. After that, it will fold and unfold quickly for easy storage when you are not using it. It has been proven that by doing a rebounding exercise properly, you can improve your cardio workout and develop stronger, sexier muscles throughout your entire body so that you become leaner, without putting too much stress on your joints or muscles. That is another reason that people feel that the Urban Rebounder is the best trampoline available. With it having a total of eight legs, with the front two, possibly being longer, it means it is adjustable. You can use it as a flat trampoline or increase the workout by slightly elevating the front side of it, while still working out a longer amount of time because your body will still not feel “stressed”. As you read through the Urban Rebounder trampoline reviews from other people who have purchased it, you will see that mostly it is all positive. They used this trampoline, they loved it, and they soon began to see results. However, it is not something that you should do and expect to see immediate results. You will have to work out consistently to achieve the best results. Check out our article on Jump Boots (here) for another great, fun way to stay in shape!